Last night the guys and I finally went to see Captain America: The Winter Soldier, which was really good! Tomorrow is Free Comic Book Day and the guys are going on a pilgrimage to a bunch of local shops, mostly so The Beard can try to snag these. His HeroClix collection might rival my polish for sheer volume. Well...maybe not. He might have only 600 of them. Anyway...the timing seemed perfect to do something inspired by comic books. I like the end result, but it wasn't without its challenges. I bought my first MASH stamping plates recently and when I went to use two of the images on Mash-67, I noticed something. The letters are backwards!? The images on stamping plates wind up in the same direction on the nail as on the plate, since they reverse twice when transferred onto the stamper and onto the nail. As longtime reader and friend, Karen, pointed out...!MOOB. I had to make decals instead of just using them as-is. Erg. How frustrating! They stamped really cleanly, so I can't complain there, but...what were these people thinking? Doing them as decals meant I'd probably have two issues, bubbling and thickness. It wound up going better than any of my previous attempts, but I still don't think it's as good as it would have been if I could have just stamped them. Grr. 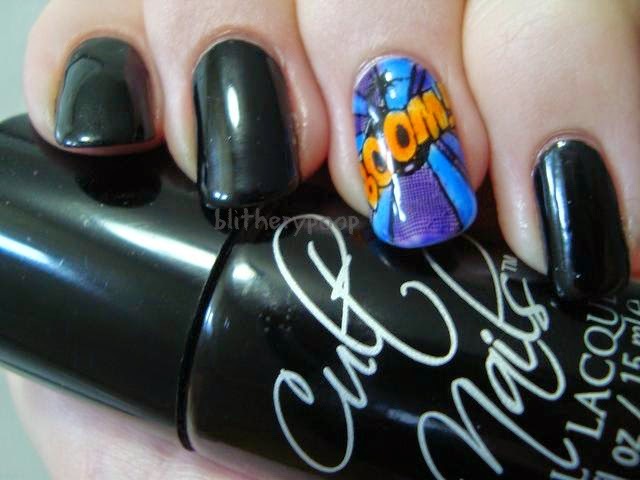 I used Cult Nails Nevermore and SinfulShine Wisp, and made the decals with Nevermore too. This was the manicure of endless frustration though. I'd planned to do the leadlight technique to add color with two of Sally Hansen's new Palm Beach Jellies...which are actually tints. I thought they might work over white. Nope! They're uselessly sheer, at least when it comes to this project. I will find some use for them or die trying, dammit! I fell back on the tried and true L'Oreal Miss Candy jellies. REAL jellies! The BOOM! 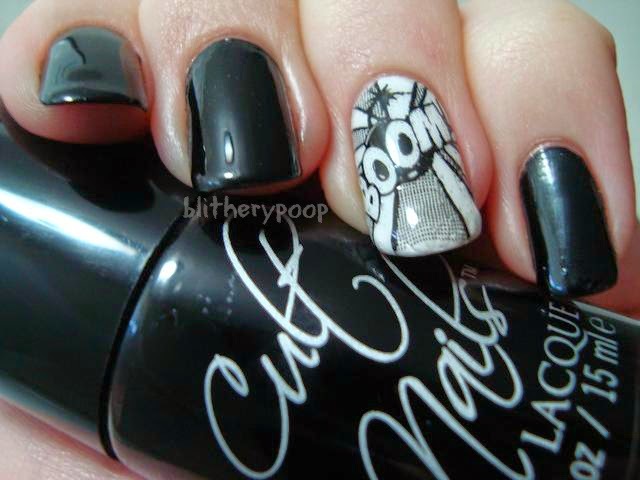 nail got a burst of Mango Mamma to pop out over a background of Miss Pixie and Berry Nice. I colorized the POW! with Jolly Lolly and Miss Pixie. Zeus pointed out that the "P" in POW! isn't the most visible thing ever and I agree...but I still like it! Using the L'Oreal jellies worked out way better than my original idea, but it's still one of those manis that looks better from slightly farther away. We've all been there, right? So...not one of my best, but more "fun" than my usual, right? Are any of you going out for Free Comic Book Day? 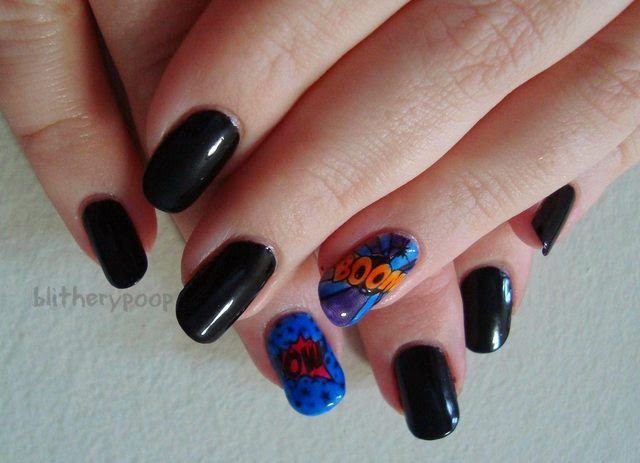 Any themed manis? Backwards plates!? That sounds SO frustrating! You did a great job though, the colour looks fabulous! I haven't seen Cap2 yet, so far all I know is that Anthony Mackie is the hottest guy in the universe. Thanks! :D It makes me wonder if they tested them on stampers only and thought they had them right-way-around. I absolutely loved the political intrigue in Capitan America 2!! & live the Marvel Cinematic Universe. As for the jellies, I used Sally Hansen tints to do this aquarelle like mani a coupke of weeks ago. That's what those are good for. Hmm...I could see that looking cool!